The North-west corner of France is a mix of spectacular coastline, rolling hills, magical islands, Celtic culture and rich tradition, gastronomy and friendly people. 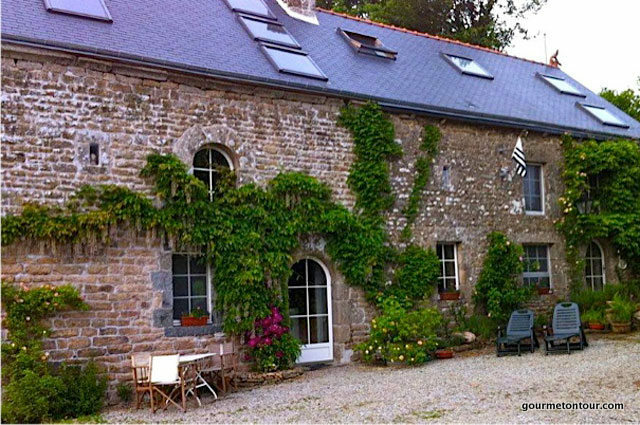 Brittany rewards visitors with hearty delicacies and world-renown seafood, and with its famous Breton crepes washed down with local cider. 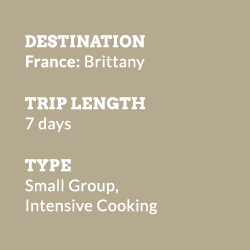 Join us for one of the best cooking courses in France; an intensive culinary class, guided by our wonderful Michelin-star trained chef and discover the real Brittany. 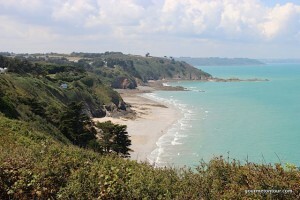 Brittany is renowned for the quality and variety of its seafood. Cancale oysters and scallops are sought for their unique taste and culinary delight. 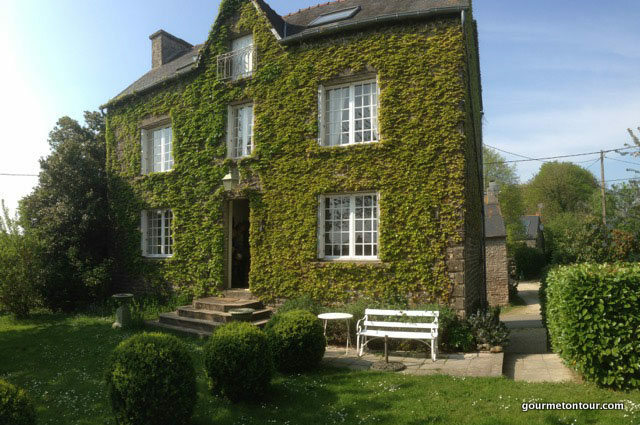 Brittany is also famous for a whole range of wonderful dishes from the famous galette buckwheat pancake to the “Far Briton”, a local custard cake. The mussels and lobsters of Brittany are considered the best in the world. The region is also known for its artichokes, ciders and local cheeses as well as its locally produced calvados or “eau de vie” – the water of life! 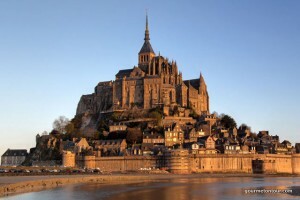 Brittany is also famous for its extraordinary coastline, its medieval castles, towns and villages. Great tracts of original forest remain where wild boar roam. 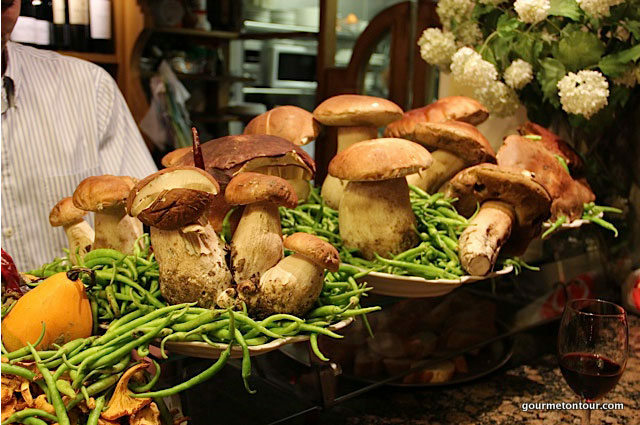 The forests also contain bountiful supplies of ceps (Porcini), girolles (chanterelles) and other mushrooms in season. We are located in one of the most beautiful unspoilt places on earth. The roads are free of traffic. The night sky is free of light pollution. The gently rolling hills of Le Mené are delightful for both cyclists and hikers with their extraordinary collection of hidden medieval hamlets and friendly locals. Enter any bar here and males are expected to shake the hands of all other males present and kiss all females twice on the cheek. You may come as a stranger but you will leave as a friend. 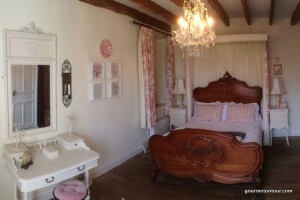 We are positioned within a few hours drive of two of the top tourist destinations in France. Le Mont St Michell to the north and Carnac to the south. 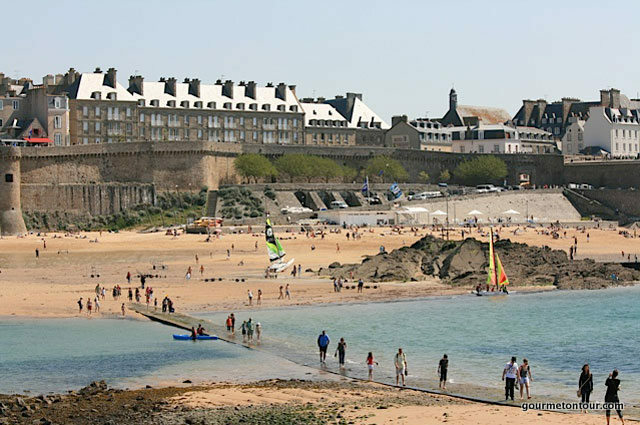 Other exciting places to visit on your trip to Brittany include the famous walled town of St Malo, the medieval towns of Dinan, Josselin and not forgetting one of the best food markets in France (Marché des Lices) at Rennes on a Saturday morning. Prepare to be bowled over by the sheer variety of seafood and products on offer. 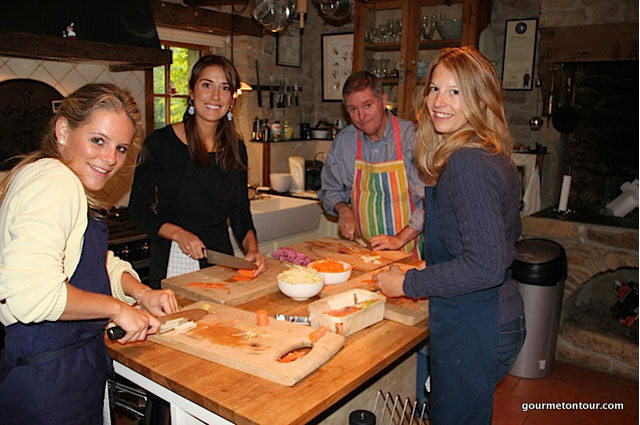 Your cooking class will be held in a beautifully restored 16th century royal residential mansion. The course is focused on gourmet quality French and modern European cuisine. Menus will vary depending on markets and the season but in general the class will undertake food preparation for full lunch and dinner at the school each day to include starter, main course and dessert/cheese with wine, expert guidance on specialist areas including fish, seafood, shellfish, meats, game, cheeses, soups, sauce preparation, stock making, baking, breads and pastries smoking, preserving, menu planning, table setting, wines and the use of knives and kitchen equipment. Recipes, menus, and sumptuous gourmet meals with wines are included. The course concludes with certificate and graduation dinner. Whatever your level, we will ensure you gain key skills whether it be preparing lobsters, smoking salmon, making sorbets, mousselines, pastries, sauces, ice creams, garnishes and the best of the wonderful French cuisine to turn you into a competent and confident home chef. You will gain lots of culinary tips and knowledge which can only be acquired from working alongside highly skilled and experienced chefs. All meals taken at the school are to Michelin standard. 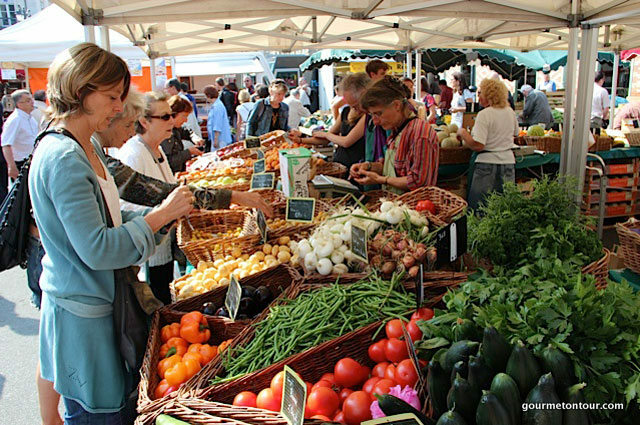 Guided tours to food markets and beautiful medieval towns arranged. Specialist menus available on request. Groups catered for on arrangement. Ask us about our private dining options. Explore the rugged coastlines with some of the world’s most breathtaking views. 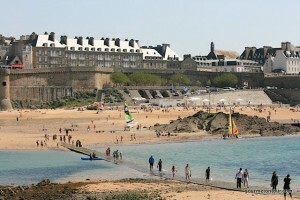 Visit Saint-Malo, an ancient seaside town with cobbled streets and brimming with restaurants. Dinan, one of the prettiest medieval walled cities in France with its 15th-century half-timbered buildings and cobbled streets. Fougeres with it’s chateaux was frequented by Chateaubriand, Balzac and Victor Hugo. Brest’s most famous must-see draws are the Recouvrance Bridge, Brest Castle, rue de Siam and well-known seafood restaurants. Marvel at Mont-Saint-Michel, a UNESCO world Heritage site with incredible 360-degree views. Indulge in Spa seawater treatments, France’s famous Thalassotherapy was born in Brittany. Enjoy a large arrays of outdoor sports, especially on the water. With its situation on the Atlantic, this is an ideal vacation spot for sailing, kayaking, canoeing, surfing and scuba diving. This is a famous cycling area. Electric Bicycles are available to hire (20 Euros per week) on request. Ask about our selected cycle routes. 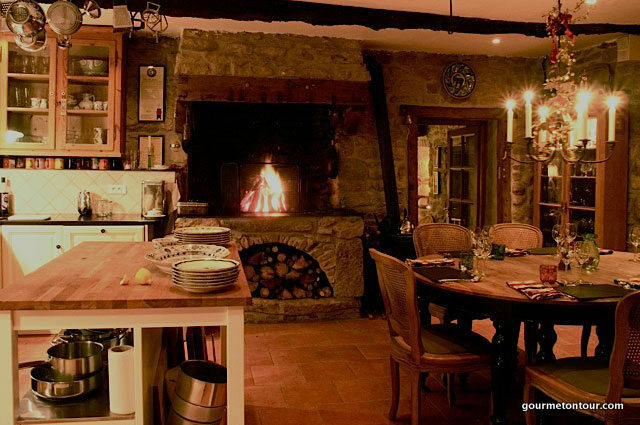 There are a variety of wonderful places to stay around our cooking school: The local village gites are walking distance from the cooking school and have either 2 or 4 bedrooms with large lounges and lovely gardens or beautiful courtyards. Or you can choose to stay in a luxurious guesthouse in a magnificently restored nineteenth century chateau in the heart of the Côte d’Armor in Brittany and set a delightful castle park. The chateaux is approx. 20 min drive from the cooking school. 7 day/6 nights intensive cooking course. Arrival is on the day before the class (Sunday) and departure in the morning after the last class and farewell dinner (Saturday). Additional cooking class weeks are available upon request. Non-participating partners are welcome to join the meals and excursions. Please enquire. Arrival in Brittany in the afternoon – Welcome dinner at the cooking school. Daily cooking course in the morning, followed by lunch – Afternoon at leisure – Late afternoon cooking course – Dinner with your creations. 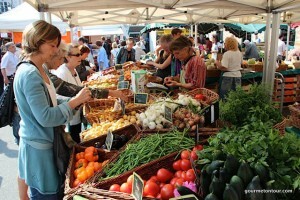 On market day, we visit a local picturesque food market where we will have lunch. There is a break each day following lunch and before dinner allowing guests to relax or explore the local area (normally between 2:30 to 5:30 p.m.). Bring comfortable walking shoes! Love every minute of the cooking. “I don’t really know how to begin to thank you for such a perfect week. You made us feel so welcome. It was like coming to stay with old friends. We both loved every minute of the cooking, eating, drinking, laughing, exploring, biking, partying, graduating and salt tossing…. Some of the best food I have ever tasted. “I am happy to report we had a really excellent week. Lots of hands on experience and learning. Poulwas an excellent teacher and host and the location accommodation were fine. We reflected on the experience and the work we had done and had so much to praise. I would rate the whole package and programme as excellent! 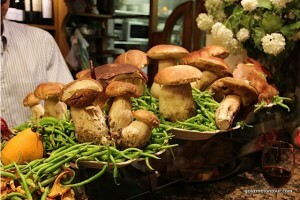 “I’ve always wanted to learn how to create an intimate dining experience…. I learnt from the best, hands down I can’t think of a better and more qualified person to teach this course, and a more beautiful location to soak it all in. Chef, sommelier, restaurant owner and operator in multiple countries, and that was before establishing his very own dining school. Whether you are interested in the cooking, dining wining food shopping, gardening aspect of this holistic culinary experience, Chef Poul can cater to your needs. Adults learn by doing, kids learn by watching. There were plenty of “doing”! You are in for a treat with a “hands on” course with undivided attention from Chef Poul. The cooking piece was just a part of it, think wine pairing, food styling….You will be at awe with his attention to details and how he rallies everyone at the dinner table, a perfect exemplification of a super host, made easy by his rich culinary background, multilingual and multicultural self.